This cruise includes a trip along the Rhine-Main-Danube canal (a masterpiece of engineering), and along the Danube River. Pass through four of Europe’s most important countries (Germany, Austria, Hungary and Slovakia), three world-famous capital cities (Vienna, Budapest and Bratislava), and through diverse landscapes such as the “Schlögener Schlinge” below Passau, the picturesque, myth-enshrouded Wachau region, and the Danube-knee at Visegrad (the Hungarian Wachau), with imposing architectural buildings along the banks of the rivers, such as Melk Abbey and the Esztergom Basilica. The cruise can be booked either from the Bavarian town of Nuremberg to Budapest – the “Queen of the Danube”, or in the opposite direction. Your journey along the beautiful blue Danube begins in the Bavarian town of Nuremberg, where you check into your Amadeus ship during the afternoon. Get to know the cruise director at a Welcome Cocktail and enjoy your first evening with a Welcome Dinner on board, while your ship sets course for Regensburg. You arrive in Regensburg at lunchtime. In the afternoon you have the opportunity to view Regensburg’s magically beautiful, Medieval old town, either on your own or as part of a guided tour. In the evening, you can enjoy a typical Bavarian evening on board, after which the ship continues to Passau. Your ship arrives in the Bavarian city of Passau, also known as the “City of Three Rivers”, where the mighty Danube converges with the green Inn River and the Ilz River. You can visit the romantic old town in the afternoon on a sightseeing walk, allowing yourself to be inspired by Passau’s winding lanes and historical buildings. In the late afternoon, you return to your ship and continue your journey to the Austrian Wachau region. Your cruise ship stops at numerous memorable places today, starting in Melk/Emmersdorf, where your ship docks in the early morning. 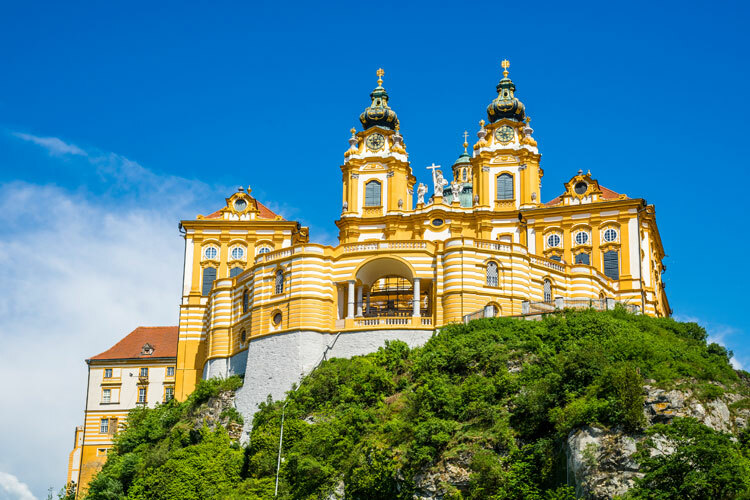 You can visit the Baroque Melk Abbey and learn more about its eventful 900-year history. Your journey then continues along the Danube, through the UNESCO World Natural Heritage region of the Wachau. Your ship docks for lunch in the well-known wine village of Dürnstein, and in the afternoon you can take a leisurely stroll through the town, ending with wine tasting. Your ship will then weigh anchor and take you to the Austrian capital city of Vienna, where the evening concert, “Sound of Vienna”, provides a fittingly atmospheric conclusion to this eventful day. You have the whole day at your disposal to explore this majestic metropolis on the Danube – Vienna. In the morning, an organised extensive city sightseeing tour, which takes you to the most beautiful landmarks and majestic buildings of this former residence of the Habsburg family. After lunch, you can join a guided tour to the magnificent Schönbrunn Palace, which will draw both art-lovers and the general public into its spell. Your ship leaves Vienna shortly before midnight and heads for Bratislava. Early in the morning, your Amadeus ship arrives in the Slovakian capital of Bratislava. In the morning, take a city walk or a guided sightseeing tour in order to discover this magnificent city with its Gothic and Baroque architecture. After lunch, you have the opportunity to take a drive along the “Marchfelder Schlösserstraße” and visit the imperial Festschloss Hof, where the Austrian Empress Maria Theresia once resided. In the evening, a festive Captain’s Gala Dinner awaits you on board and your ship will depart for the last stage of the journey. At breakfast time, your ship arrives in the majestic metropolis of Budapest, where you can enjoy a comfortable morning city sightseeing tour, which takes you to its beautiful buildings and landmarks. After a generous lunch on board, you can take part in an afternoon excursion to Gödöllo Palace, a former residence of the Austrian Empress “Sissi” (Elizabeth), where you will enjoy a comprehensive tour through this sumptuous 18th century palace. The highlight of the day is a romantic evening cruise through Budapest, which is festively lit up at night, together with a typical Hungarian folklore show on board your floating luxury hotel. Enjoy a generous breakfast on board before you disembark and take leave of the Amadeus crew.